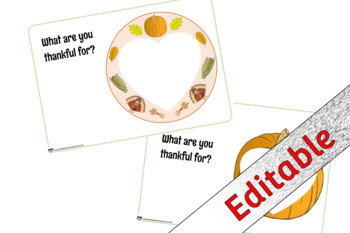 Thanksgiving mark making/writing/drawing activity sheets. Why not ask your children ‘What are you thankful for?’ Depending on their level of development and preferences, children can create their own drawings, emergent writing or you could scribe their responses. As this is an editable word doc file, you can edit as you like. Perfect for an early years display with all of the things individual children are thankful for. Pack includes 2 pages each with a separate design. For our FREE locked uneditable original pdf versions of all resources visit www.littleowlsresources.com.